My wife is a very understanding woman. Not only does she tolerate my hobby, she actively encourages it. She plays games with me, but more importantly, she buys games for me. My wife also knows me well. She knows I love out of production games, she knows I love dinosaurs, and she knows I love a good bargain. That's why, when she saw a copy of Jurassic Dinosaurs in a charity shop for 50p, she purchased it for me. The divorce papers are being finalised. Okay, I'm kidding. We're not really getting divorced. Mainly because I immediately realised how bad this game was, and I never played it. Yes, you read that right. This is a review for a game I've never played. Sue me. Actually, don't. I can't afford it. I've never written a review about a game I've never played before, but in this case I've made an exception. You'll see why. 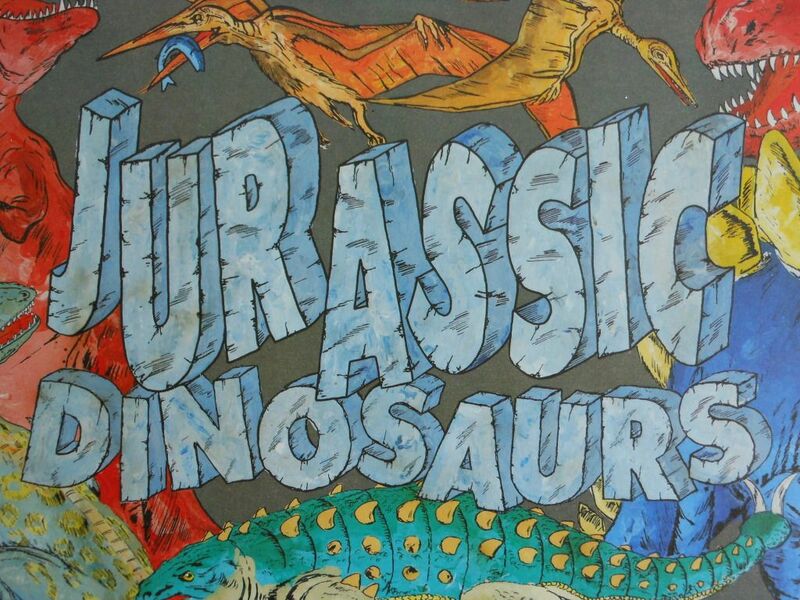 The first thing that struck me about Jurassic Dinosaurs is that it seemed much older than it really is. The art design and component quality looks like something out of the late 70s, and yet, it was made in 1993, that's four years after Heroquest was released! They wrote the price on the box!? THEY WROTE ON THE BOX! So yes, I was slightly suspicious of this game before I even opened the (slightly crumpled) box. I was also slightly annoyed because the charity shop had written the 50p price on the box lid with a freaking permanent marker. Seriously? I'll never say a bad word about tape monkeys again, because they are no longer my number one enemy. Once I got the box open, my suspicions were confirmed. The board consisted of two pieces that fit together like a jigsaw to reveal a hideous map overlaid with a linear path. Each space on the path is shaped like a footprint, and some of those footprints contain text like "Trapped by lava, miss a go," and "throw again!!" There are also certain spaces linked to other spaces by arrows. Some arrows point up, and some point down. "Miss a go!!" - One of the more exciting spaces to land on, I'm sure. My heart sank. It's Snakes and Ladders. By this point, my interest had pretty much bottomed out; but I thought I would take a look at what the playing pieces were like. 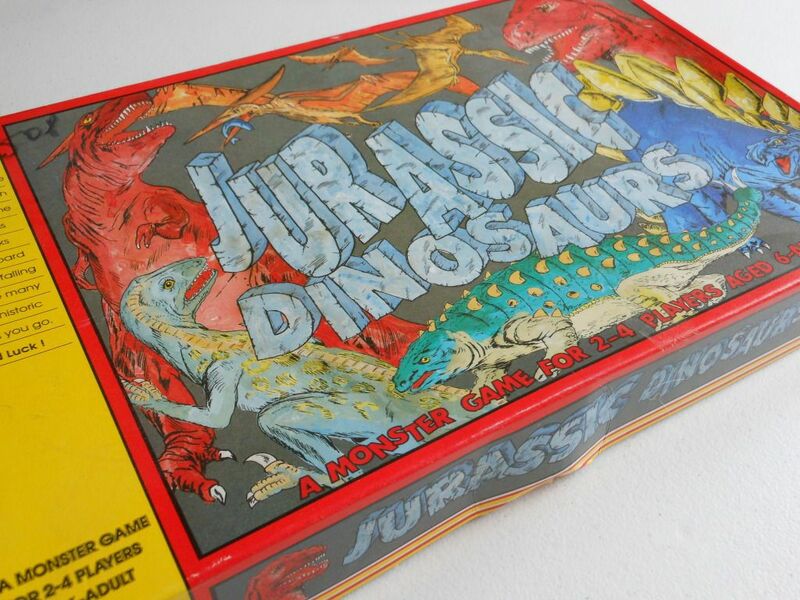 Unfortunately they weren't any more interesting: There is a thin card insert in the box, and the dinosaur pieces are printed on that. You punch them out and pop them in little plastic stands. The pieces for the copy I have are still attached to the card insert, and that means the poor kid who had this game before me didn't bother to play it either. However, I was intrigued to see two other pieces printed on the insert that needed to be punched out and assembled, and for a moment I was almost interested again. Almost. The first is a larger t-rex piece. A quick look at the rules (which consist of four paragraphs printed on the bottom of the box!) revealed that when you roll the dice to move, you also move the t-rex. If the t-rex moves over a playing piece, that piece is moved back six spaces; if the t-rex lands on a playing piece, then that piece moves back 12 spaces. Spectacular! It should also be noted that there are shortcuts printed on the board that only the t-rex can move on. The idea is that you can cleverly use these spaces to use the t-rex to attack your opponents while making sure it doesn't end up in a position to attack you. Of course, I just made that sound much more exciting that it really is. The other piece printed on the cardboard insert is a 3D volcano that is supposed to be assembled and sat on the start space of the board. 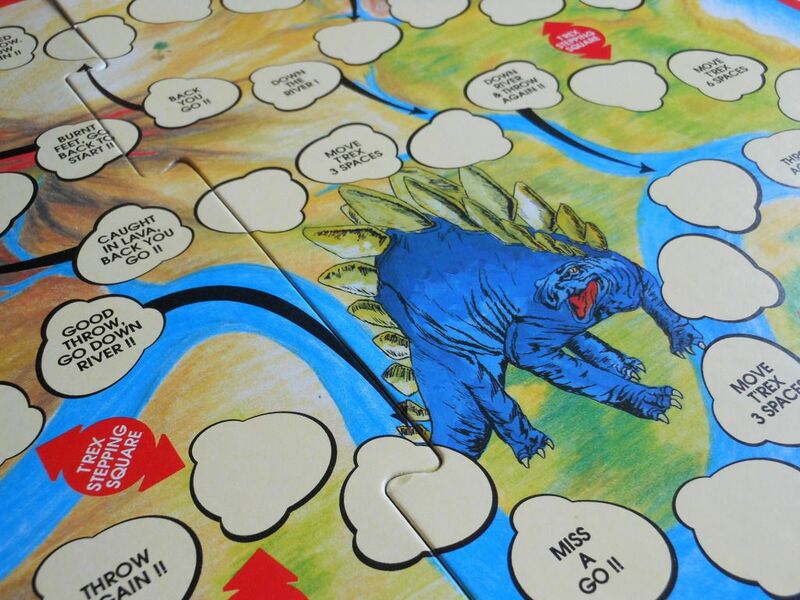 The "storyline" behind the game is that the dinosaurs are trying to escape the erupting volcano, and that is the sole reason the three-dimensional volcano piece exists. It doesn't actually do anything. It is just there to look cool and 3D. Unfortunately, it just looks cheap and badly made. Something of a missed opportunity really. 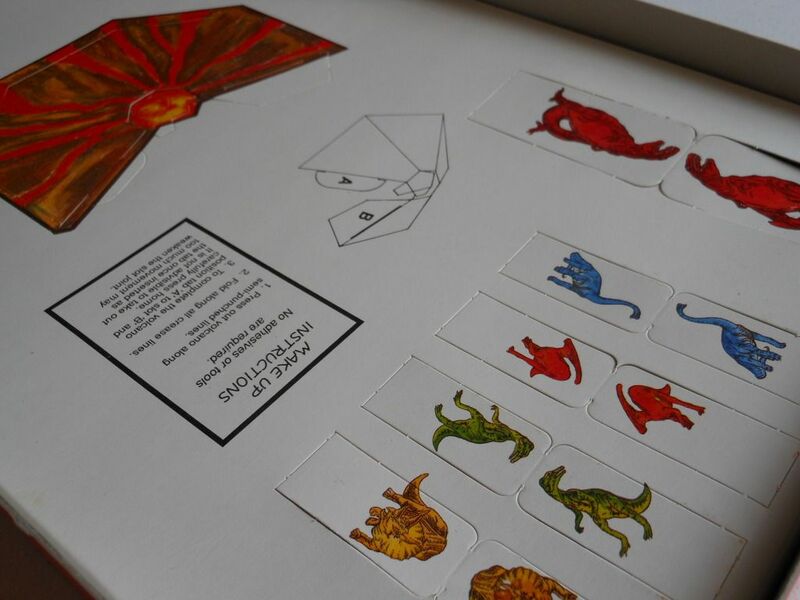 The cardboard insert with playing pieces still attached. And that's your lot. Roll the dice. Move. Move the t-rex. Stare at the volcano. The pieces for this game remain unpunched. The board was assembled only so I could take a picture for this review (which you won't have seen if you aren't reading this on my blog). And no, I am not keeping this game. I think I will burn it. Okay, okay... I'm being unfair. Snakes and Ladders has it's place in the world. It is a great first game for kids, and it helps to teach counting, fair play, and social skills. I don't have a problem with Snakes and Ladders as such, and I would rather see a family playing any game rather than watching television. What I have a problem with is a cheaply made knock-off of Snakes and Ladders with a recommended age of six and up. Children are not stupid. Children should expect better than this.